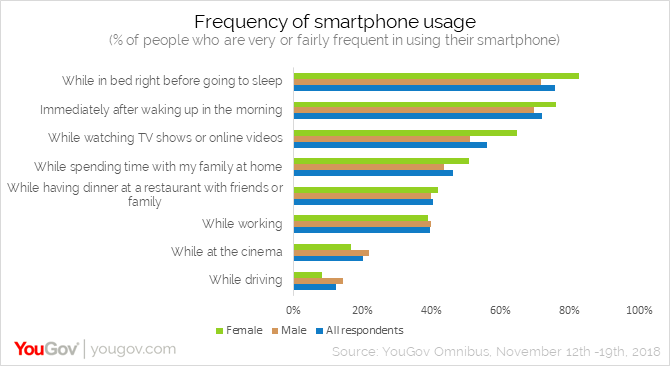 YouGov | Is today’s consumer really spending a quarter of their day glued to their smartphone? on November 26, 2018, 8:54 a.m. It appears that respondents recognise a trend of increased activity on their device with around 6 in 10 respondents saying they spend more time on their phone now than they did a year ago and 63% saying they frequently use their phone even when it keeps them away from more productive activities. 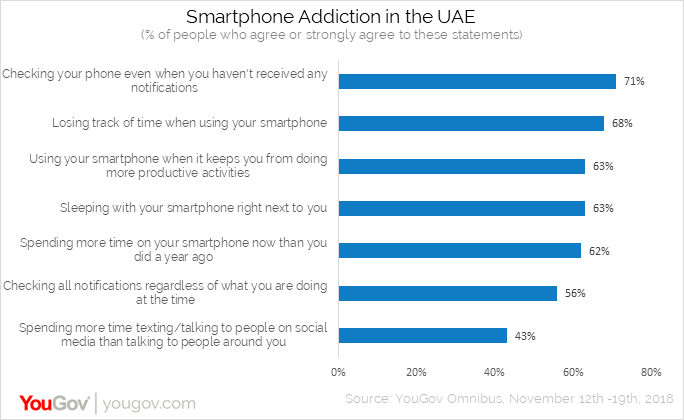 Although addiction to smartphones is unavoidable in today’s digital age, three-quarter of respondents regularly take steps to limit their phone usage. The most prominent steps consumers are putting in place are to put their phone on silent (41%), limit the apps installed (30%), keeping the phone out of reach (25%) and adjusting the settings to receive fewer notifications (21%). Men seem more willing to take regular steps to limit usage when compared to women. In other steps of reduction, 1 in 5 respondents stated not using their phone during specific times of the day, with evening taking priority for screen time. Right after waking up and the first half of the day when work starts emerged as the most common times when people avoid using their phones. Data collected online by YouGov Omnibus among 1,012 respondents in the UAE between 12th and 19th November 2018 using YouGov’s panel of over 6 million people worldwide. Data is representative of the adult online population in the country.